When Will Corning Inc. Split Its Stock Again? It seems it's been a millennium since the last time Corning split. Corning (NYSE:GLW) stock has had its ups and downs. 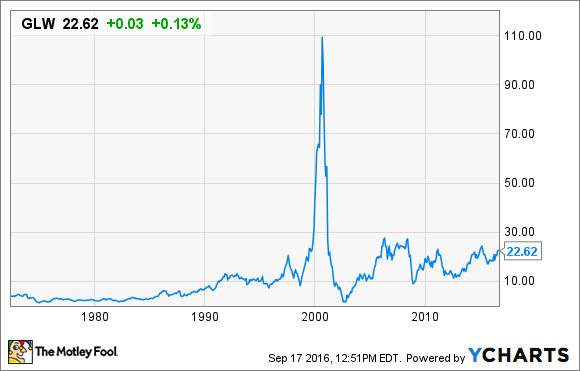 Sixteen years ago, Corning stock was up -- a lot -- and trading north of $100 a share. That was before the dot-com Bubble burst, though, and in the wake of that event, Corning stock quickly fell below $2. The new millennium, however, has seen a remarkable resurgence in Corning shares, which have risen more than 10 times in price -- and gained 35% just this year. This may get investors to wondering: Isn't it about time for Corning to split its stock? I don't see much chance that Corning will split its stock again anytime soon, and I'll tell you why. Corning's coming off another disappointing quarter right now; one that featured declines not just in revenues, but in earnings as well. Now, some analysts believe the company is approaching an "inflection point" of higher glass shipments, and higher profit margins on those shipments -- and indeed, we did see Corning produce higher gross margins last quarter. It's just that overall revenues declined, and the better gross wasn't enough to take up the slack. If future quarters see rising revenues, though, and profit margins hold steady or even improve, then it could be that Corning stock will continue growing strongly. Whether it grows enough to result in a stock split, though, will still be a judgment call made by management. Management will have to weigh whether the additional liquidity provided by having more shares outstanding (more shares makes it easier for large investors to "get in" and "get out" of a stock), and the lower apparent price (lower stock prices look more affordable) are likely to attract new investors. At the same time, they'll know, of course, that splitting the stock doesn't really affect the value of the company at all. So let's take a look at the company's recent history of splitting its stock and see if we can guess what it would take to induce management to pull the trigger. Here's a quick primer on Corning's stock splits over the past three decades. DATA SOURCEs: SplitHistory.com, Yahoo! Finance. Historically speaking, Corning seems to prefer waiting until its stock is trading in the high double digits before splitting its stock. A high share price doesn't necessarily mean it will split its stock, of course (see how long it waited in 2000), but it does increase the likelihood that management will begin giving the idea serious thought. Judging from this, Corning is probably still a good ways away from doing a stock split. At a share price of $22 and change, Corning sits comfortably within the double digits right now, but not the high double digits. Continued weakness in revenues, in profit margins, or both, risk depressing Corning's stock price to the point that even a 2-for-1 stock split would have the shares trading in the single-digits -- and Corning seems averse to splitting its stock when this could result in a single-digit stock price. Granted, some investors might be attracted by such small numbers, and be more inclined to buy Corning stock because it would look cheap. Corning, on the other hand, has shown no indication that it wants its stock to look cheap. Past stock splits were timed primarily to prevent the stock from looking too "expensive," by preventing the stock's face value price from drifting into the triple digits. I don't think there's any "risk" of seeing that happen today.